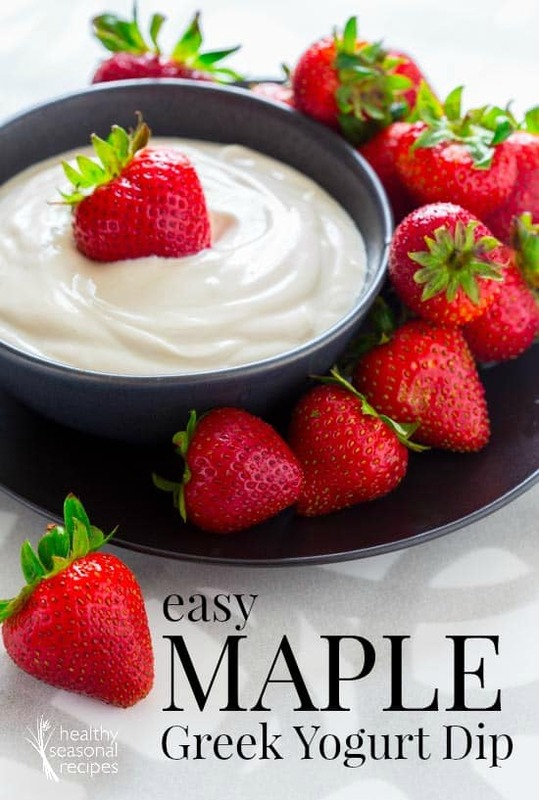 Three simple ingredients come together to make this easy maple Greek yogurt dip. Dip fresh summer berries into this 5-minute dip for a healthy snack. 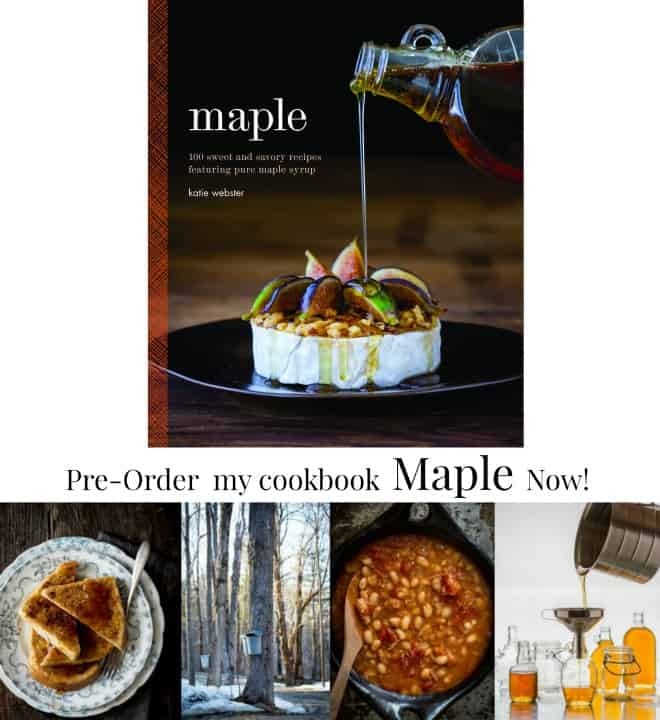 Earlier this week when I was brainstorming new ideas for summer recipes, I couldn’t get this easy Maple Greek Yogurt Dip out of my mind. I kept thinking about shooting it with fresh seasonal strawberries, with loads of backlighting and maybe even doing a tiny video to show you how head smackingly easy it is. Like so easy a caveman could do it. Nay! So easy a slightly dim mosquito could do it. That’s how easy it is! Even a mosquito can pull that off. Amiright? 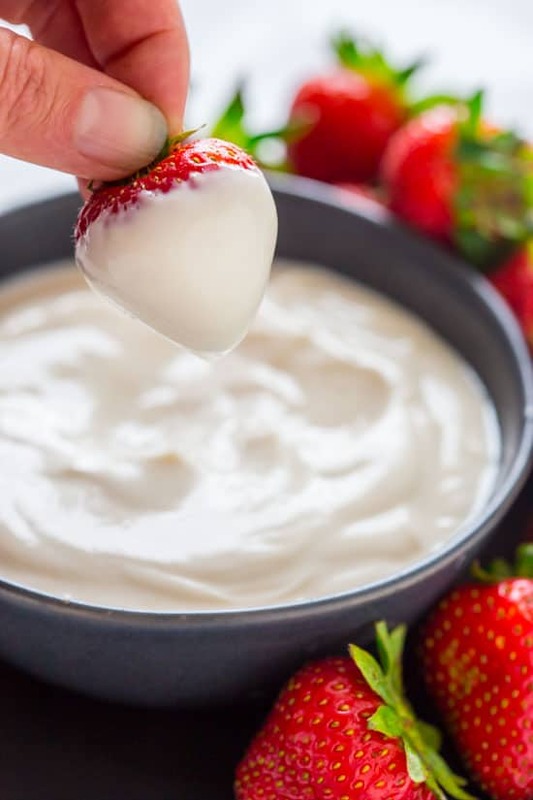 This easy dip recipe makes for a wonderful fruit dip and pairs well with anything that’s in season. Just slice up some free stone peaches or ripe plums later this summer. Or dip in some perfect local berries and you will be so happy! 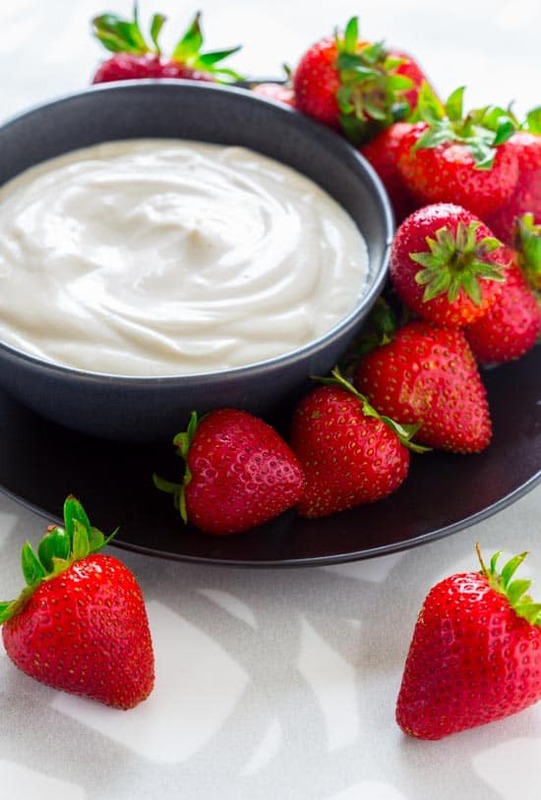 If you’re prepping this Greek yogurt fruit dip for a party, you can make it up to a day ahead of time and keep it in the fridge until you’re ready to serve. Slice up a bunch of fruit and lay it out on a platter for your guests to enjoy! I bet you could even serve this maple Greek yogurt dip with cinnamon pita chips. You might also be able to use this yogurt dip in place of the cream cheese in these fruit and cream cheese lunch wraps. The options are endless! Thanks so much for visiting! 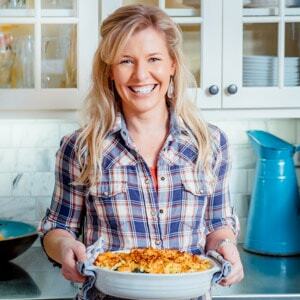 If you’re new here, you may want to sign up for my email list or follow me on facebook to keep up with the latest posts. 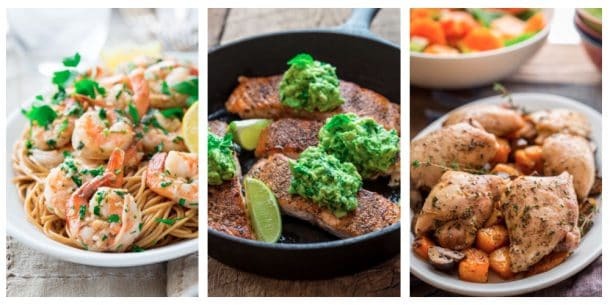 Three ingredients and five minutes (or maybe a little less) to make! 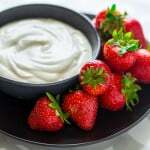 Plain fat-free yogurt is sweetened and flavored with dark pure maple syrup and almond extract to make a creamy and sweet yogurt dip for fresh summer fruit. Combine yogurt, maple and almond extract in a bowl. Whisk to combine. Serve immediately or chill up to 1 day ahead. Thanks so much Meg. It makes a great snack. My daughters ate it when they got off the bus for theirs, and I was thrilled with that! Terrific! Loving strawberry season. Your dip is a must try soon!!! Local berries are finally in here in Vermont. I will be enjoying this dip with them for their short season and then I’ll have to move on to other summer fruitss. THanks so much for coming by and for your comment Diane. oh my this looks good– and those strawberries! Thank you my friend. Hope you’re having a great day. so simple and looks amazing. love the video! I loved doing the video too. I can’t wait to do more of them. Thanks for coming by Jessica. I never have made sweet dips before so clearly I have to make this recipe. Greek yoghurt, fruit and maple sounds like such a killer combination and so perfect for summer/hot weather. Thanks so much Thalia. Hope you like it. Going to re-watch and re-read all your tips again- I tried backlit photography yesterday without much success- granted, I was rushing it and not really paying attention! This dip looks amazing and I love how easy the ingredient list is! Shoot me a direct message if you want and we can trouble shoot. And take a pic of your set up next time you try it. Glad you like this dip. It is so easy! Looks so silky and wonderful!